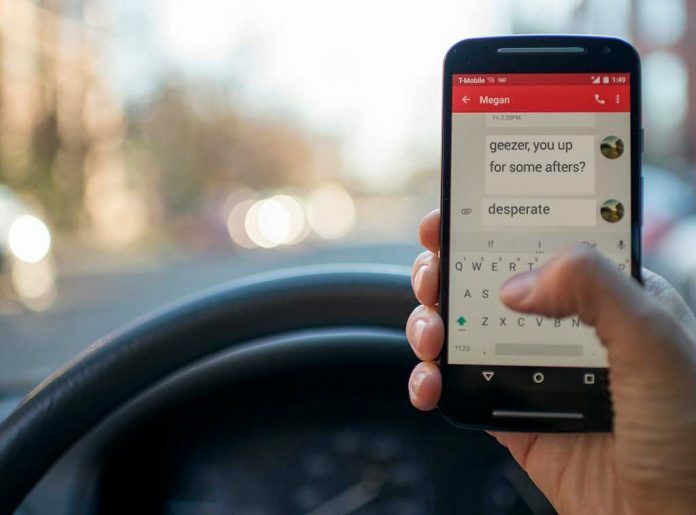 Using a mobile phone at the wheel will be punishable by six points, the same as drunk or drugged driving, under a new Spanish law currently being drafted by the Government. The tough stance is intended to tackle the ever increasing number of accidents caused by telephone distractions. However, lawmakers say it is not the telephone call itself that is proving to be the greatest menace; Traffico state that drivers responding to WhatsApp, email and other texting communications are now the number one cause of road traffic accidents in Spain. Traffico had already announced that it would severely punish the use of mobile phones when driving, and have now proceeded to draft new laws. The draft of the new Traffic Law stipulates that use of phones and other communication devices while driving will be punished with six points on the driving license. This doubles the current three points. As yet there is no clarification on exactly what will be covered by the terms of the devices, e.g. whether it will apply to fixed GPS and in-car Computer systems, many of which are connected to the internet. Neither is there clarification on what is considered operating by hand, so as to know whether touch to activate/answer/hang up systems will be permissible. The six point penalty will make using a phone equal in fine to that of drink driving, drugged driving, driving recklessly, driving in the opposite direction, participating in races or using radar detection mechanisms. The new law also includes an increase in the number of points that are recovered after passing the awareness and road re-education courses, since it seeks to “compensate for aspects that increase the punitive pressure on drivers” with “measures that favour behaviour change, and that reward those who adopt passive and safe driving techniques”. The new education courses will enable a recovery of 8 points, up 2 from the current 6, and will be of 12 hours duration. The course required to recover a licence once banned will last 24 hours. In addition, safe driving courses will serve to reward the driver with 2 additional points, up to a ceiling of 15, with a maximum frequency of one course every two years. The term to recover the initial balance of points without undertaking education courses will be unified to two years. The current distinction between serious sanctions (two years) and very serious sanctions (three years), will be removed, providing the driver has not incurred additional sanctions within the two years. A comment that I think will be unnecessary for readers in Ibiza, but helpful to those in the UK, Ireland and elsewhere. I cannot comment on Spain generally, but certainly in Ibiza the sight of people using their phones – talking and texting – while driving is relatively commonplace. Most people I know would agree with this new tough law. But they will also have the same concern as me; will it be enforced? In this respect Britain differs greatly to Spain, or at least Ibiza. In Britain, laws tend to be exactly that, and generally enforced. Living here it is all a bit more, how can I put it, vague. Though there is little doubt traffic laws are receiving greater attention that they have historically, e.g. with post-nightclub alcohol checks and mobile speed cameras, there are other areas of traffic law that are seemingly ignored. For example the taxis of Ibiza have apparent immunity from the observance of speed regulations, and stories of ‘informal’ undocumented police fines continue to thrive, as does a feeling that motor infractions are seen as a form of raising income rather than any interest in their legal intent. We should not forget that using a telephone whilst driving already carries a not insignificant 3 point penalty, yet drivers here seem to routinely flout the law. Whether this new law will make a difference depends not only on its wordings and penalties, but whether it will actually be enforced, and we will not know that until some time after its enactment.